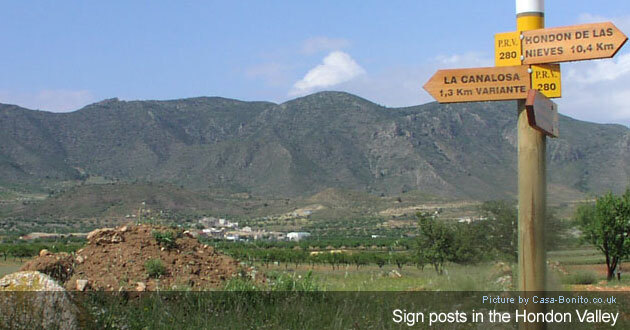 The area is well known for its Grape Vines, Wine and Almond Groves. 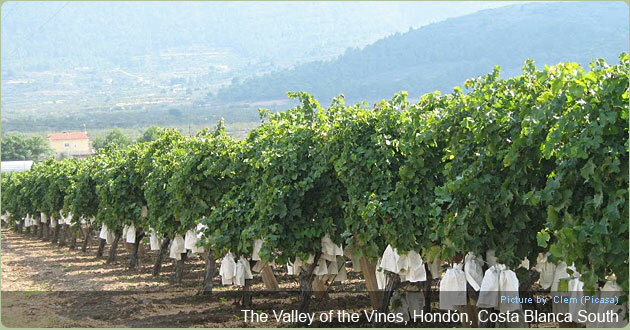 It is sometimes called ‘The Valley of the Vines’. For the ramblers the mountain climb / walks are a superb way of experiencing fresh air, exercise, rural Spain and incredible vistas. 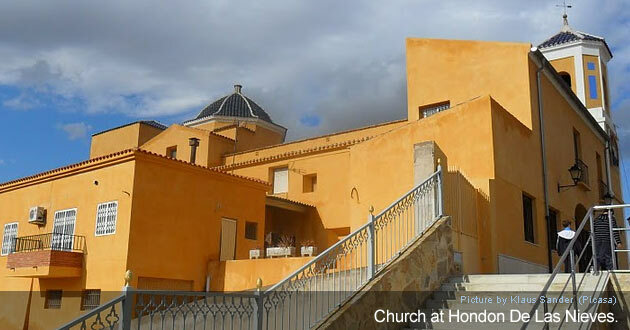 The village of Hondon de las Nieves has a very attractive and newly renovated church on the hill. In the square (plaza) below and surrounding streets there are a number of small bars and restaurants, local bakers, butchers, a medical centre, dentist, iron mongers, chemist, banks, optician, solicitor, hairdressers, shoe shop, supermarkets, electrical goods suppliers, petrol station, a post office, school, and a 24 hour shop ... all you need really. There is a general market twice a week and of course a few Wine Bodegas, please try the Bodegas Cerda (Outstanding!) for those very tasty and very inexpensive Spanish wines. 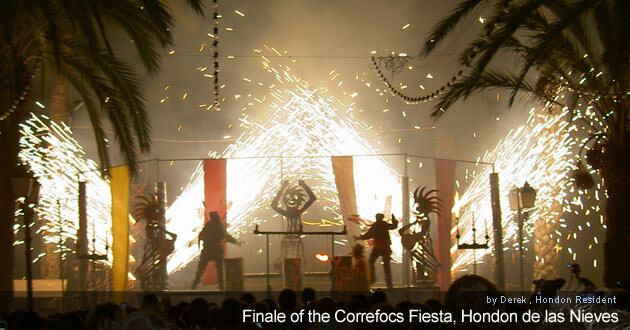 The bars/diners are in the main plaza: Destiny's, Bar Central, Bocadito Gourmet, La Font, Vamboo. 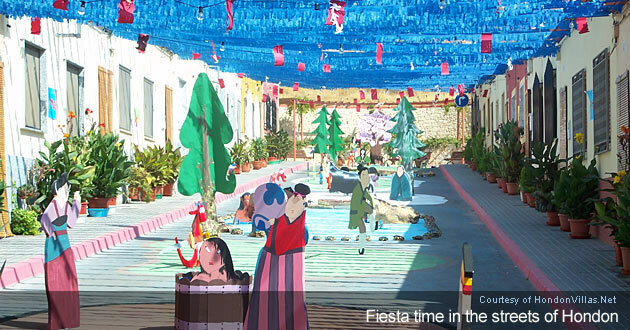 Many Fiestas are held in the village and the Spanish love to party, they also know how to do it well. 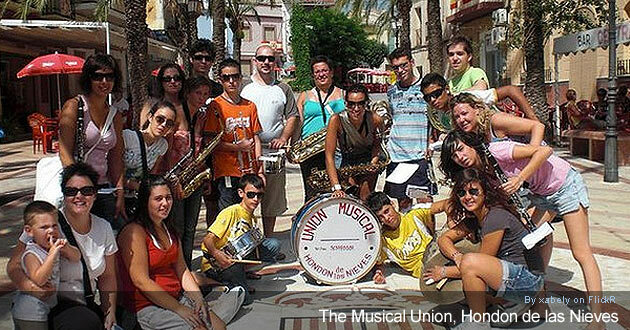 One Fiesta in August which is a brilliant night is the Medieval Markets and Fiestas with costumed characters, music, stalls and games. 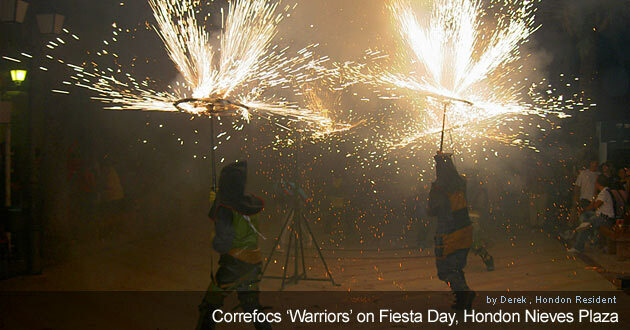 At the end of the night there is a spectacular firework "Correfocs" display, which should not to be missed. 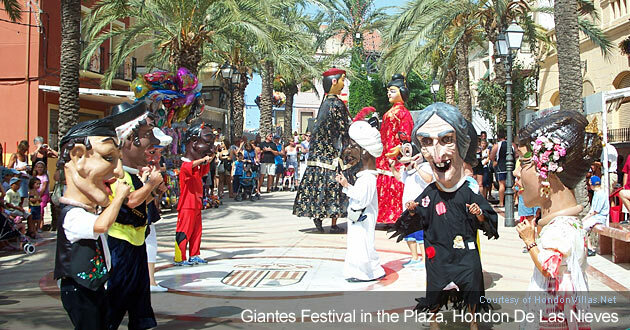 The decorative street competitions take place which are very colourful, not to mention the amazing costumes worn by the whole family of adults and children. There are many villages and towns to visit too many to list but all within 5 to 20 minutes drive, here are a few to give you a taster of the places to visit around the Hondon Valley. Hondon de las Frailes is only a 5 minutes drive away, here you can find all local amenities including a private gym, a private Doctor, Physiotherapist, Town hall and a lovely church. Shops include a garden centre, ironmongers (DIY), butcher, grocers, tobacconist and a pet shop/vet + beauty salons. 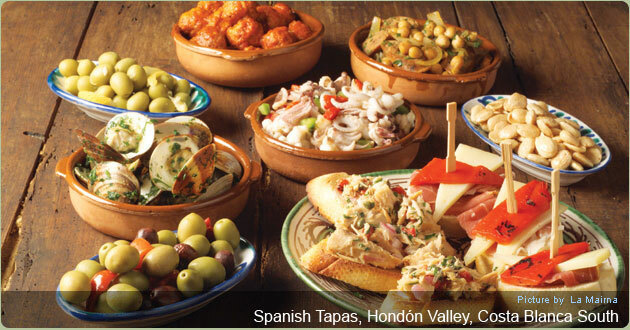 We have many bars and restaurants: Veintiocho (28), El Nuevo Valle, El Romero, La Buena Vida, El Condor, Bar Pepin and El Fogon – All recommended for al-fresco Tapas, daily meals and dinner or to just while away the hours!. We hear the breakfasts are excellent too! (which if you are Spanish might be just a strong coffee and a brandy. Alguena only 15 minutes drive where a local Sunday market is well worth the visit as is the nearby 'Marble Mountain' that can be seen from the road into the village and is quite amazing. Aspe, a larger town is approximately 15 minutes drive away with all main amenities available, a large supermarket and market day here is Tuesday and Thursday. This is a very busy place with quite a lot of buildings with character, a central park, a lovely church square and an indoor food market. 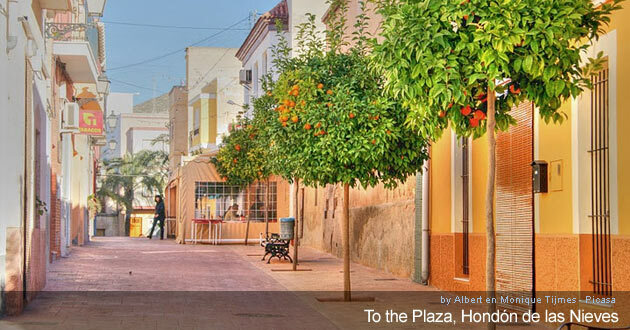 Elche is approximately 20 minutes drive and is known as the City of the Palms. It has lovely parks and as the name suggests 1000′s of palm trees almost everywhere! This is also the area where the shoe shops/outlets are in abundance… so if shoes are your thing you are sure to get some here. There is a large modern shopping centre called Al’ Jub with designer shops, children’s shops, jewellers and accessory shops, household shops, pet shops and of course more shoe shops! The centre houses a large food, electrical, clothes and fancy goods supermarket selling almost anything! If you are in need of a drink or a bite to eat then visit the food mall upstairs where there are with many choices of restaurants, bars and fast food bars + a cinema and bowling alley. So there’s plenty to do nearby. Property Locations: Rural property for sale in Albatera, Aspe, Elche, Novelda, Hondon de las Nieves, Hondon de los Frailes, Alicante, Costa Blanca South in Spain. Plus searching for Spanish property on La Montanosa Villas for Sale with a swimming pool and parking. Read the News, Weather, Properties and Holidays in Hondon. Wine Bodega in Hondon. 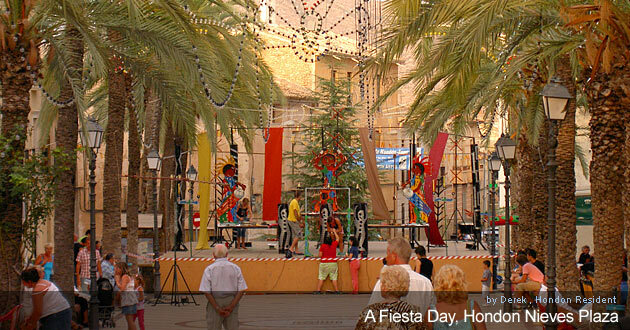 Fiestas such as Medieval Market. 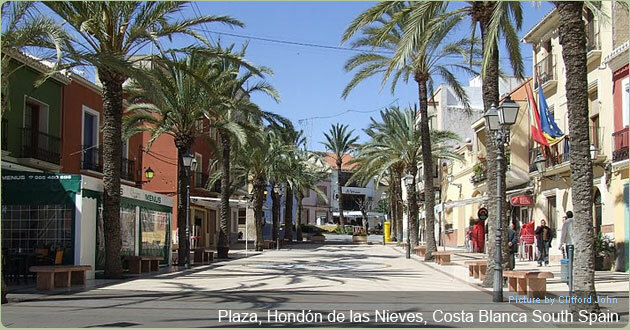 We have many properties to buy in Hondon de las Nieves, Hondon de los Frailes and Albatera Villas. 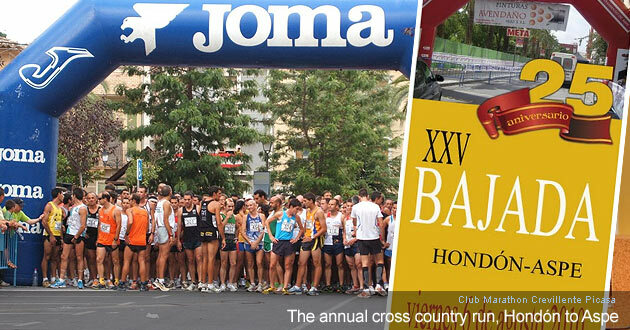 The nearby urbanisation is called La Montañosa Hondón. You can view fincas, holiday cottages, luxury villas with new build villas from established local builders. Many real estate agents are based in the HONDON VALLEY selling homes, houses, villas and fincas. 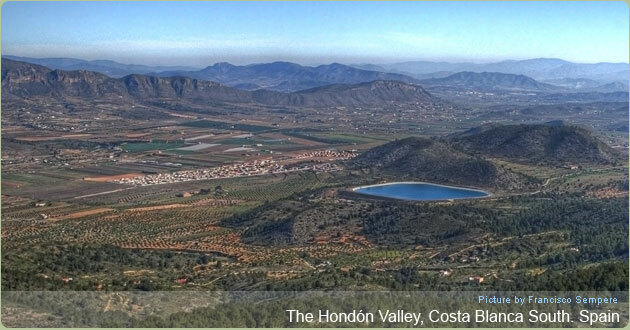 Spain: The weather in the Hondon Valley is mostly sunshine and warm to very hot all year round. January and February are usually the coolest months with day times being about 18 degrees in the sun but a lot colder in the shade and at night... you'll need warm clothing and heating in your house. 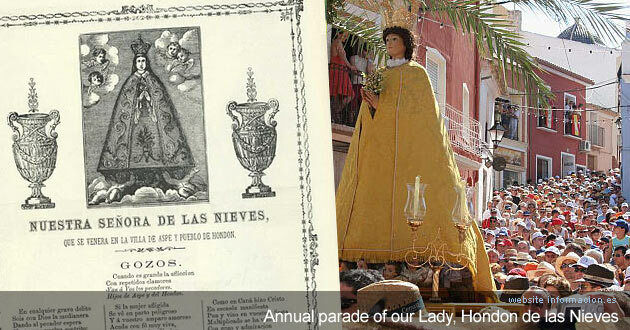 We write for many Hondon Valley blogs: Villas in Nieves or visit the Village Community website or the local Facebook Page.